Gordian III. AD 238-244. Æ Sestertius (31mm, 19.69 gm). Rome mint. Gordian III. AD 238-244. Æ Sestertius (31mm, 19.69 gm). Rome mint. IMP [G]ORDIANVS PIVS FEL AVG, laureate, draped, and cuirassed bust right / LAETITIA AVG, Laetitia standing left, holding wreath in right hand and resting left on anchor; S C across field. RIC IV 300a; Banti 38. VF, attractive patina. Marcus Aurelius. As Caesar, AD 139-161. 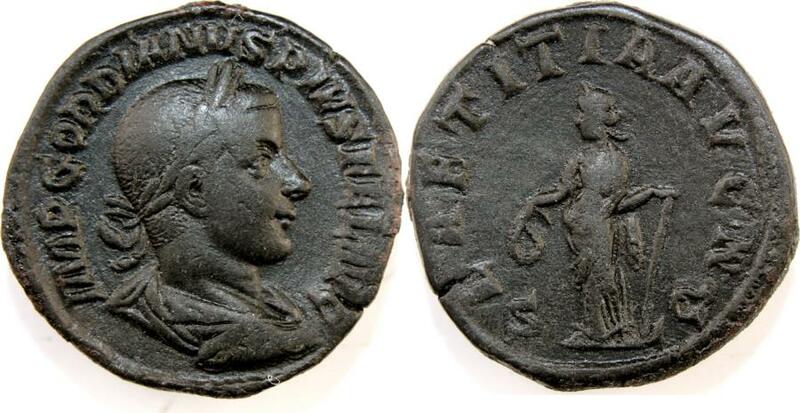 Æ Sestertius (33mm, 20.46 g). Rome mint. Severus Alexander. 222-235 AD. Æ Sestertius (22.84 gm). Struck 231-235 AD.